A business was told to pay out in excess of $67,000 after an employee was seriously injured while being elevated on a forklift to close a faulty rolled door. The man was crushed when he got trapped between the roller door and the forklift backrest at the Holsten’s Pty Ltd building in Adelaide in September 2011. He was sent to the hospital for a week for treatment for injuries to his ribs, back, right shoulder, chest, stomach and lungs. The Industrial Court were informed the man was unable to return to work following the accident. The family-run establishment imports and sells florist and wedding products. It was revealed in court the motorised roller door at the warehouse was not working properly, and employees sometimes used a forklift to reach the door when opening and closing it. 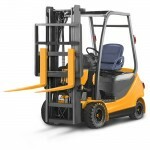 The employee operating the forklift was not certified to use it, and lifted to other worker too high which caused him to be crush against the door. The company pleaded guilty for failing to provide and maintain a safe workplace, and allowing an employee to do high risk. Industrial Magistrate Michael Ardlie said accepted the company was remorseful and subsequently made efforts to improve its safety. “The defendant sincerely regrets the injuries sustained by the employee and unreservedly apologises to the employee for the harm caused,” he said. “The defendant took steps to ensure that the employee received immediate medical attention on-site and an ambulance was called.